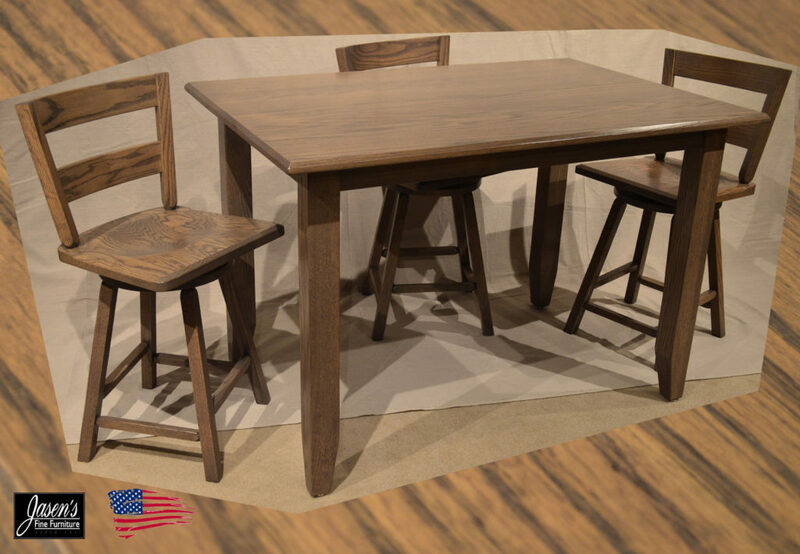 The Amish Clip Pub Set features solid oak construction throughout and special gray stain to give your area a modern lift. The counter swivel chairs feature memory swivel mechanisms so that the seat stays where you last left it. The set can be ordered in any wood specie, stain, and sizes you wish! The wood species available are oak, brown maple, rustic cherry, quarter sawn white oak and more. Once you have your size and wood specie you can choose from dozens of beautiful, yet timeless stain colors. The chairs can also be ordered with padded seats. You can select any of the 100’s of fabrics or dozens of leathers for the chairs. If you have your own material do not hesitate to bring it in and the Amish will upholster the seat with your materials!